In a bowl, add the entire packet Jell-O and pour the boiling water to it. Mix well to dissolve the Jell-O. Next stir in the yogurt and mix everything to combine. Cover and refrigerate for 1 ½ hours to thicken and not set. Meanwhile bake the mini pie shells at 350 F for 5 minutes. Cool and set aside. After 1 ½ hours, beat the thickened Jell-O-yogurt mixture at high speed for 10 minutes or until a creamy consistency is attained. Fold in the chopped strawberries and pour into pie shells and allow to set in the refrigerator for at least 2-3 hours. 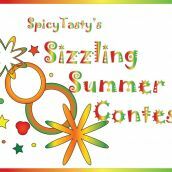 Garnish with fresh strawberries..
We are submitting this to the ongoing SIZZLING SUMMER CONTEST at Spicy Tasty. the picture itself is refreshing.... lovely colors! pictures look awesome ....dessert looks very tempting ..thank you for visiting my blog and ur appreciation..
Wow superb,lovely and colorful dessert..looks so pretty and very tempting..beautiful clicks. Wow!!! wat a beautifull pictures,amazing...Dessert luks awesome. Omg, wat an excellent, elegant and cute dessert..very catchy.. Wooooow!!!!! wat a beautiful pics dear i can't find words to express the beauty of the pic looks perfect n perfect dear. That looks scrumptious dear. Very impressive post. Superb loved the colour.very tempting pics.G8 job. WOw looks fantastic!! what a color !! Dear, the pictures look so good..very perfect for the event..dessert is so yummy..
Wow..That's a heavenly dessert..awesome clicks.. These little strawberry tarts look so cute and delicious. Lovely Lamp like gelatin dessert. Fabulous. The Okra in the previous post looks awesome. How did you even cut it like that? I love the look of it as much as how it would have tasted, had i tasted it. Yes, I love okra and they are good for one's brain. Even better, no? First time here. You have a lovely space. dessert looks yummy. do visit my blog when time permits. Beautiful pics!Love that color.yummmmyyy dessert. blog hopped and landed here..the strawberries in the cracker shell cups looks out of th world..i just want to bite into it and dissolve into the unknown world. Pic looks colorful and mouthwatering. absolutely loved the color and photography.this is gonna be a colorful addition in my summer desserts. strawberry picking is sure one of our favorite spring-time activities! love the concept of mixing three different strawberry textures. very yummy looking. i just love each and every phot that u have put here. simp[ly amazed. a feast to my eyes. Simply wonderful...great recipe ...so quick and easy.